The Client List returns for Season 2 this Sunday night, bringing us back into the scandalous life of Jennifer Love Hewitt's Riley Parks, a woman who finds herself drawn into a secret life when she takes a job working at a massage parlor in an effort to support herself and her kids when her husband leaves her. She soon discovers that this seemingly traditional day spa actually offers a little something extra to some of its clients. Check out some photos for the upcoming season premiere ahead! Based on a Lifetime movie that aired in 2010, the first season of The Client List introduced us to Hewitt's character Riley, a woman desperate to keep her financial situation afloat to support herself and her kids after her husband Kyle (Brian Hallisay) takes off. Of course, he returns later to complicate her life even further, but by that point, she's already giving happy endings at The Rub to earn some cash and make ends meet. 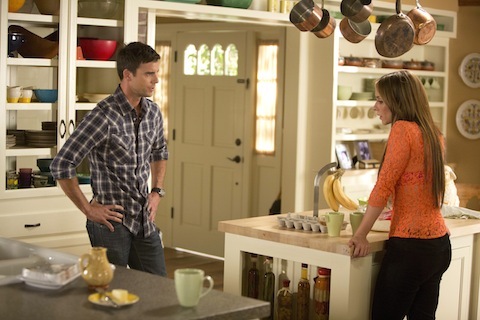 And in that time, she's also begun to develop feelings for her brother-in-law Evan (Colin Egglesfield). Lifetime promises "new threats abound" in Season 2, as trust becomes a major issue for Riley, who isn't the only one with something to hide. Season 2 of the series will be a bit longer than the first season. Given the strong ratings for Season 1, it's no surprise that Lifetime might hope to extend that good fortune in its second season, which will consist of 15 episodes, up from the 10 installments in Season 1. The first episode of Season 2 premieres Sunday, March 10 at 10:00 p.m. ET/PT on Lifetime.